Mala, also known as rufous hare-wallabies, will be protected behind an enormous cat-proof fence. Many of Australia’s mammals spend their entire lives imprisoned, glimpsing the outside world through tall chain-link fences and high-voltage wires. There are dozens of these enclosures across Australia. Many are remote, standing alone in the endless expanse of inland Australia, but others are on the outskirts of our largest cities – Melbourne, Perth, Canberra. Every year there are more of them, the imprisoned population growing, while the wild populations outside dwindle. These are Australia’s conservation fences. The captives within our conservation fences are adorable – floppy-eared bilbies, tiny hare-wallabies, long-tongued numbats – and they all share an extreme susceptibility to introduced predators. At least 68 native mammal species cannot exist in the wild if either foxes or cats are present. Many of these species once numbered in the millions, ranging from the woodlands of Queensland to the deserts of Western Australia, but predation has driven them to the brink of extinction. Fences offer these species a future in the wild, and conservation groups have risen to the challenge. Last week, the Australian Wildlife Conservancy completed a new cat-proof fence in their Newhaven Sanctuary, the largest conservation fence ever constructed. Make no mistake, these conservation fences work. Species that wilt at the sight of a fox, that have been exterminated from every corner of the Australian mainland, will explode in numbers behind fences. Along with offshore islands, inside these fences are the only places in Australia where these species can prosper – a few hundred square kilometres of safety, surrounded by 7.6 million lethal square kilometres. Environmentalists have never particularly liked fences. Rather than hide behind walls, they repeatedly took the fight to the cats and foxes on the outside. Their tactics have been diverse, innovative and brutal. Managers have rained bullets from helicopters and poison baits from planes. They have set cunning snares and traps, mimicked the smell and sound of their enemies, and have turned landscapes to ash with wildfire. Nothing has worked for the most threatened marsupials. Some of the largest and most expensive management campaigns in Australian conservation history have ended in exhaustion and stalemate, and with a retreat back behind the fences. Fences were once a source of vehement debate in conservation circles. Should they be permanent? Are fenced populations wild or captive? Should they contribute to species’ conservation status? These arguments have effectively been abandoned. Scientific studies and painful experience has proven fences and offshore islands to be the only reliable method of protecting predator-threatened species http://www.wildliferesearchmanagement.com.au/Final%20Report_0609.pdf. In place of these debates, conservation organisations and governments have turned to more practical questions of fence height, electric wire voltage and skirt depth. So now, on average, Australians are building a new fence every year, some of them truly enormous. The just-completed fence at Newhaven encloses a staggering 10,000 hectares of red sand and spinifex. By the time the project is complete, this fence will be home to 11 different threatened mammal species. And Australia is not alone: around the world, from New Zealand to Hawaii to South Africa, an archipelago of fences is emerging from an ocean of predators. It is one of the great achievements of modern conservation and has already averted the extinction of critically endangered species. Although it’s much smaller than our network of protected areas, it offers refuge to species that are long-gone from our national parks and wilderness areas. Red foxes have been extraordinarily successful in Australia. However, in recent years a concerning pattern has begun to emerge. While the number and size of fences continue to increase, the number of new species being protected has stalled. In fact, the last five fences haven’t included any new species – they have only offered additional protection to species that were already protected behind existing fences https://www.nature.com/articles/s41559-017-0456-4. As an example, the first two marsupials planned for introduction behind the Newhaven fence will be the mala (Lagorchestes hirsutus) and the burrowing bettong (Bettongia lesueur). These two species undeniably deserve more protection. Both are highly susceptible to foxes and cats and will derive tremendous benefit from the protection of this enormous fence. However, both species are already found elsewhere behind fences (four different fences for burrowing bettongs). Meanwhile, yet-to-be-published research from the National Environmental Science Program has found 41 other species that are desperately vulnerable to introduced predators are not protected by any fence. This problem is not new to conservation. In the 1990s, Australian researchers suddenly realised that our national park system was failing to protect the full range of Australian ecosystems. Despite our best efforts, we had created a system of reserves that was biased towards mountainous landscapes and deserts, and away from the fertile valley floors. The solution was to create new national parks using systematic and mathematical methods. This discovery – the theory of systematic conservation planning – revolutionised global conservation. In 2018, conservation fences need their own systematic revolution. Unfortunately, the national park system had natural advantages that fences lack. The vast majority of Australia’s protected areas belong to the state and federal governments. The centralised nature of the protected area network is perfect for systematic thinking and top-down optimisation – picture the Soviet Union’s Politburo. In contrast, the conservation fencing sector is diverse and decentralised – picture the third day of Woodstock. Fences are built by governments at the state, federal and municipal levels, by multimillion-dollar NGOs like the Australia Wildlife Conservancy, by tiny local environmentalist groups and by profit-making corporations. This diversity is a fundamental strength of the fence network, giving it access to a spectrum of funding and ideas. But it makes it almost impossible to plan in a systematic manner. You can’t tell a small bilby conservation group in western Queensland that they should protect the central Australian rock-rat instead (Zyzomys pedunculatus). It doesn’t necessarily matter to them that bilbies are already protected behind four different fences and the rock-rat has none. While conservation science tries to work this problem out, new and larger fences will continue to be built at an accelerating rate into the foreseeable future. True, the absence of coordination will make mathematicians break their slide rules, but each fence will do its job. The furry denizens will hop, and scurry, and bounce around, heedless of their precarious safety. And for us, from the outside looking in, these fences will help us forget the parlous state of Australian marsupial conservation. It will be possible to forget our record-breaking rate of extinctions, to forget the empty forests and deserts, and to imagine what a bushwalk might have been like before Europeans unleashed foxes and cats onto Australia. Research suggests there is no “safe number” of brumbies that will avoid harm to mountain ecosystems. 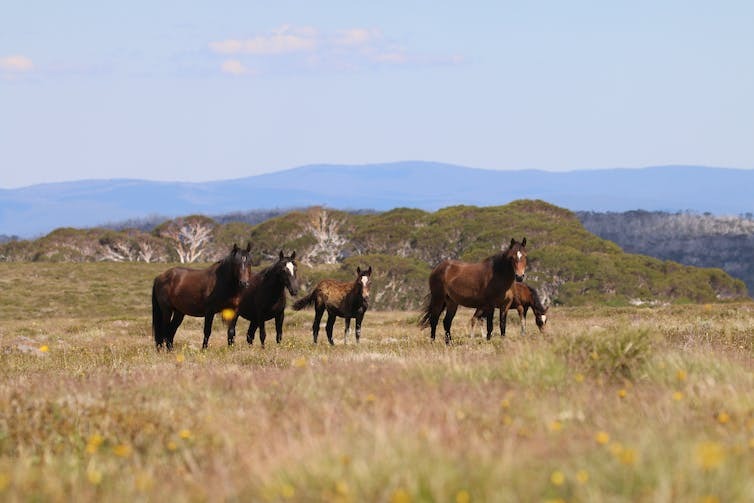 New South Wales’ proposed brumby legislation – which abandons plans to cull feral horses in Kosciuszko National Park – is a dangerously reckless policy that will escalate environmental impacts, escalate costs, and put horses at risk of extreme suffering. The New South Wales’ Deputy Premier John Barilaro was reported as saying the cultural significance of the brumbies needed to be recognised. But the evidence regarding feral horse (brumby) impacts on the environment in the Australian alps makes it clear that large numbers of feral horses are incompatible with maintaining the ecological values of Kosciuszko National Park. Feral horses damage waterways, degrade soil, spread weeds and alter vegetation. These changes are likely to have negative impacts on native fauna. Reports to both the Victorian and NSW governments have expressed concern over the impact on threatened species unless horses are culled. In NSW, horses directly destroy the habitat of already threatened species, including two species of critically endangered corroboree frogs, the critically endangered smoky mouse, endangered reptiles like the alpine she-oak skink and Guthega skink, and several plant species. In its report, Parks Victoria suggested that native mammals such as wallabies and kangaroos are also out-competed and driven away by feral horses. The threat posed by feral horses to native species and communities is so great that the NSW Threatened Species Scientific Committee has released a preliminary determination to list feral horses as a key threatening process. This report demonstrates that feral horses have well established environmental impacts and that action to reduce this threat is now urgent. What’s more, there may be no “safe level” of feral horse numbers, below which the environment can cope with the damage. In a new report for the Victorian government, the impacts of feral horses on the Bogong High Plains was found to be cumulative, meaning that the damage caused by even a small number of horses accumulates over time, because the rate of recovery in alpine conditions is extremely slow. Contrary to the “brumby bill” which would leave thousands of feral horses in Kosciuszko National Park, and contrary to the draft management plan that would reduce feral horses down to 600 over 20 years, to prevent horse damage, all of the horses must be removed. Removing all of the feral horses from Kosciuszko National Park is also a value judgement. NSW sets aside only 9.2% of its land in protected areas. That’s less than 10% where nature conservation has priority, and more than 90% where people and our livestock and crops take precedence. This is already an extreme compromise, and does not even reach international targets under the Convention on Biological Diversity to have 17% of land area in protected areas. The brumby bill will worsen this already below-par compromise by reneging on commitments to protect Australian native species, and transforming our national park into a playground for escaped exotic livestock. The bill proposes to move horses from sensitive areas into less sensitive parts of the national park. But this is likely to fail, for two reasons. First, there is no clear way that this could be achieved without great cost and horse suffering. Trapping horses has been experimented with since 2008, with, on average, 450 horses removed from Kosciuszko each year, at a cost of more than A$1,000 per horse. This was from open woodland habitat with good road access. But many of the most sensitive environments are in the least accessible areas, such as the main Kosciuszko range. Without culling, it is not clear how parks staff could remove horses from these areas. At best, it would be expensive because it would be so labour-intensive. It would require new infrastructure in remote areas (which is undesirable for several reasons), and could require mustering with helicopters, also very costly. Mustering, trapping and trucking horses have serious animal welfare concerns, making them a crueller alternative than culling. Second, moving more horses into areas that are already overrun by these quadrupeds places the horse population at risk of ecological collapse. Horse populations can increase at 20% or more every year. There were 6,000 horses in Kosciuszko National Park in 2014, so there could be more than twice that number by now. By moving horses from one part of the park to another, the brumby bill will inevitably lead to unprecedented horse densities relative to the food available. There would be a real risk of mass horse starvation. By ignoring these basic ecological processes, the bill is likely to preside over more horse suffering than would be caused by a cull. The proposed legislation is bad for horses, disastrous for the environment and, if relocations are actually implemented, extremely expensive. There are less cruel, cheaper, and more environmentally friendly solutions to this problem. Cull the horses in the national park (the least cruel of the range of viable methods), constrain brumby herds to the many private properties around the park to foster innovation in ecotourism, and invest in other environmentally friendly cultural activities to celebrate brumby culture, such as horse events outside the park, signs such as those around Victoria’s alpine huts, sculptures, poetry and movies. This is the win-win solution we should be aiming for, not the reckless version on the table at the moment. This article was amended on May 22, 2018, to clarify that the brumby population in Kosciuszko National Park was 6,000 in 2014, not 2016 as previously stated. No cases of feline parvovirus were reported from the 1980s until 2015. A deadly feline disease is now spreading between cats after hiding in nature for nearly 40 years. Multiple cases of feline parvovirus, also known as cat plague, or panleukopenia, have been reported in stay kittens in the greater Melbourne area this week. Feline parvovirus was a common disease in the 1960s and 1970s. Australia was one of the first countries to develop an effective vaccine. Once widespread vaccination became routine, the disease was pushed back into nature. Most cases of parvovirus are in kittens and young cats. In the 1970s, cases were typically seen in unvaccinated kittens purchased from markets or pet stores, and in shelters where vaccination protocols were lax. Between the early 1980s and 2015, cases were unreported, but no doubt feral and semi-owned cats were still sporadically infected. The re-emergence first occurred in animal shelters in Mildura and Melbourne in 2016 and south-western Sydney in 2016. Many cats died. Even survivors suffered greatly. In all these outbreaks, affected cats had one thing in common – they had not been vaccinated. What is feline parvovirus and how does it kill? Feline parvovirus has a predilection for infecting rapidly dividing tissues. Cells lining the small intestine of infected cats are killed, resulting in vomiting, diarrhoea (often bloody), fever, lethargy, anorexia and sometimes sudden death. The bone marrow is transiently wiped out by the virus, resulting in a depletion of white blood cells. As a result, infected cats are unable to fight the invasion by secondary bacteria that attack the leaky gut wall. Most cases of feline parvovirus are in unvaccinated kittens or young cats. The welfare of cats is hugely impacted by this terrible disease – it makes cats miserable for many days, if they survive. Treatment involves intensive therapy in hospital: intravenous fluids by infusion pump, medication to reduce vomiting, expensive anti-viral treatment (omega-interferon), opioids for pain relief, antibiotics to treat secondary bacterial infections, and occasionally blood or plasma transfusions and nutritional support (feeding tubes). This eight-week-old kitten, Cola, wasn’t vaccinated and contracted feline parvovirus. She needed a transfusion and recovered from the infection. Treatment can costs thousands of dollars, and many owners just can’t afford it. But even with treatment, the fatality rate remains high. Feline parvovirus is spread by faeco-oral contamination: from infected cats shedding virus in their faeces. Litter trays and natural latrines (such as sandboxes) are prime sources of infection. This may occur where infected cats are kept close to uninfected cats (in shelters and pounds), and in homes where cats have outdoor access. But you can track feline parvovirus into your house on your shoes or clothing, so even 100% indoor cats are not safe. Feline parvovirus can usually be quickly diagnosed by veterinarians using rapid point-of-care test kits and then confirmed in a lab. There is no risk of this virus spreading to human patients. Feline parvovirus was never completely eliminated from the Australian cat population and instead has been maintained at low levels in the unowned and feral cat population for the past 40 years. Remember, there are perhaps six times as many unowned cats than owned cats in Australia! This adaptable virus also has the potential to infect foxes and wild dogs, only later to be passed back to cats, providing a variety of potential environmental reservoirs. Perhaps with an increased effort to rehabilitate and rehome “fringe dwelling cats”, it was inevitable that the virus would spill back from these unvaccinated cats into the general pet cat population, given waning herd immunity. Consistent with this hypothesis is the first outbreak occurring in rural Mildura, a somewhat underprivileged socioeconomic area (government figures show the median household income is A$878 per week), and subject to incursions by feral cats, foxes and wild dogs – including dogs used for hunting. Unvaccinated pet cats permitted the re-emergence of the virus. It is our suspicion that the cost of vaccinating the family cat (currently more than A$200 for a kitten requiring a course of two to three vaccines) exceeds the budget for many pet owners. The best protection for any cat (and every cat) is widespread vaccination of as many cats as possible in the community at large. This “herd immunity” is the best protection against this highly contagious, persistent, resistant virus. When vaccination rates fall below 70%, cat populations are in trouble. How do we protect pet cats? Vaccination against feline parvovirus is highly effective (more than 99%) and is given by veterinarians as part of an F3 or F4 vaccine at the same time as a routine health check. If a kitten has received two or three kitten vaccinations (the last one at 16-18 weeks of age), and a booster one year later, it likely has excellent protection against the virus, probably for several years, and possibly for life. Is it time to vaccinate? If your adult cat has received an annual vaccination in the past three years, it likely has excellent protection. If your cat is more than three years overdue for its vaccination, it is sensible to visit your local veterinarian soon. Your cat will develop or maintain excellent protection within a few days of vaccination. But what about unowned and feral cats? We need to support efforts to vaccinate cats that have never been vaccinated against feline parvovirus – cats owned by people who are unable to afford vaccinations, and cats that have been dumped and are now unowned and free-roaming. New South Wales is making some progress in this area. The NSW Cat Protection Society responded to a 2017 outbreak by subsidising free vaccinations for cat owners in Sydney. RSPCA NSW has ongoing targeted low-cost vaccination programs for cat owners, particularly in regional and remote areas of NSW. Trap-neuter and return programs, while controversial, usually involve administering a F3/F4 vaccination to unowned and feral cats, thereby boosting herd immunity against feline parvovirus and also possibly reducing cat numbers. Finally, for people who cannot afford veterinary care because of their life circumstances, Pets in the Park and similar charities can provide another option for vaccination. Remember, the larger the proportion of the cat population that is vaccinated, the less chance any cat and every cat has of becoming infected. Stated another way, it’s far more effective to maximise the proportion of the cat population that is vaccinated, rather than over-vaccinating only a limited proportion of cats. Most of the world’s wild horses, such as the Australian brumby, are outside their historic native range. Throughout history, humans have taken plants and animals with them as they travelled the world. Those that survived the journey to establish populations in the diaspora have found new opportunities as they integrate into new ecosystems. These immigrant populations have come to be regarded as “invaders” and “aliens” that threaten pristine nature. But for many species, migration may just be a way to survive the global extinction crisis. In our recently published study, we found that one of the Earth’s most imperilled group of species is hanging on in part thanks to introduced populations. Megafauna – plant-eating terrestrial mammals weighing more than 100kg – have established in new and unexpected places. These “feral” populations are rewilding the world with unique and fascinating ecological functions that had been lost for thousands of years. Today’s world of giants is only a shadow of its former glory. Around 50,000 years ago, giant kangaroos, rhino-like diprotodons, and other unimaginable animals were lost from Australia. Later, around 12,000 years ago, the last of the mammoths, glyptodonts, several species of horses and camels, house-sized ground sloths and other great beasts vanished from North America. In New Zealand, a mere 800 years ago, a riot of giant flightless birds still grazed and browsed the landscape. The loss of Earth’s largest terrestrial animals at the end of the Pleistocene was most likely caused by humans. Sadly, even those large beasts that survived that collapse are now being lost, with 60% of today’s megafauna threatened with extinction. This threat is leading to international calls for urgent intervention to save the last of Earth’s giants. Formal conservation distribution maps show that much of Earth is empty of megafauna. But this is only a part of the picture. Many megafauna are now found outside their historic native ranges. 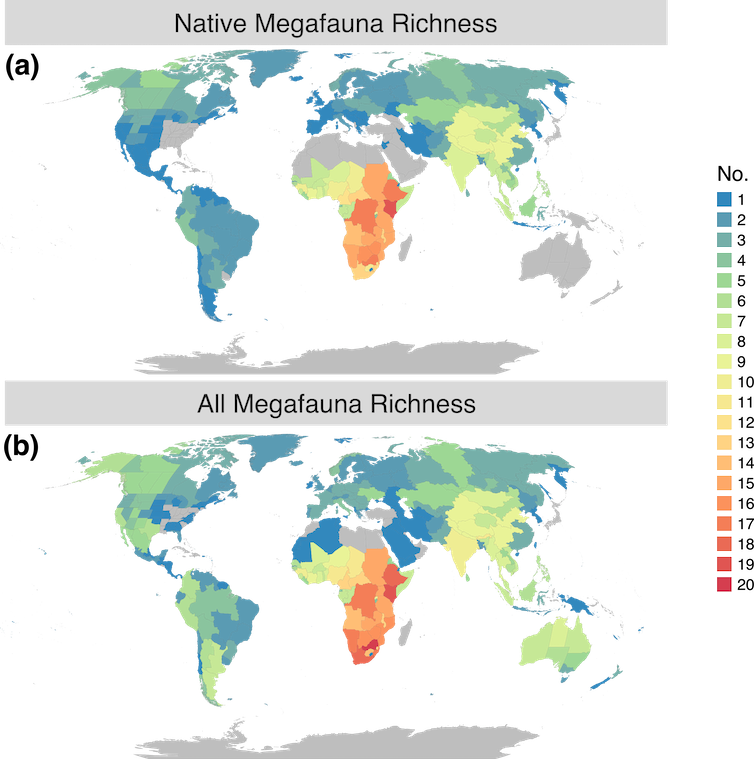 In fact, thanks to introduced populations, regional megafauna species richness is substantially higher today than at any other time during the past 10,000 years. Worldwide introductions have increased the number of megafauna by 11% in Africa and Asia, by 33% in Europe, by 57% in North America, by 62% in South America, and by 100% in Australia. Australia lost all of its native megafauna tens of thousands of years ago, but today has eight introduced megafauna species, including the world’s only wild population of dromedary camels. Australia lost all of its native megafauna tens of thousands of years ago, but is now home to eight introduced species, including the world’s only population of wild dromedary camels. Remote camera trap footage from our research program shows wild brumbies, wild donkeys and wild camels sharing water sources with Australian dingoes, emus and bustards in the deserts of South Australia. These immigrant megafauna have found critical sanctuary. Overall, 64% of introduced megafauna species are either threatened, extinct, or declining in their native ranges. Some megafauna have survived thanks to domestication and subsequent “feralisation”, forming a bridge between the wild pre-agricultural landscapes of the early Holocene almost 10,000 years ago, to the wild post-industrial ecosystems of the Anthropocene today. Wild cattle, for example, are descendants of the extinct aurochs. Meanwhile, the wild camels of Australia have brought back a species extinct in the wild for thousands of years. Likewise, the vast majority of the world’s wild horses and wild donkeys are feral. There have been global calls to rewild the world, but rewilding has already been happening, often with little intention and in unexpected ways. A small population of wild hippopotamuses has recently established in South America. The nicknamed “cocaine hippos” are the offspring of animals who escaped the abandoned hacienda of Colombian drug lord Pablo Escobar. Colombia’s growing ‘cocaine hippo’ population is descended from animals kept at Pablo Escobar’s hacienda. By insisting that only idealised pre-human ecosystems are worth conserving, we overlook the fact that these emerging new forms of wilderness are not only common but critical to the survival of many existing ecosystems. Megafauna are Earth’s tree-breakers, wood-eaters, hole-diggers, trailblazers, wallowers, nutrient-movers, and seed-carriers. By consuming coarse, fibrous plant matter they drive nutrient cycles that enrich soils, restructure plant communities, and help other species to survive. The wide wanderings of megafauna move nutrients uphill that would otherwise wash downstream and into the oceans. These animals can be thought of as “nutrient pumps” that help maintain soil fertility. Megafauna also sustain communities of scavengers and predators. In North America, we have found that introduced wild donkeys, locally known as “burros”, dig wells more than a metre deep to reach groundwater. At least 31 species use these wells, and in certain conditions they become nurseries for germinating trees. Introduced wild donkeys (burros) are engineering the Sonoran Desert, United States. The removal of donkeys and other introduced megafauna to protect desert springs in North America and Australia seems to have led to an exuberant growth of wetland vegetation that constricted open water habitat, dried some springs, and ultimately resulted in the extinction of native fish. Ironically, land managers now simulate megafauna by manually removing vegetation. It is likely that introduced megafauna are doing much more that remains unknown because we have yet to accept these organisms as having ecological value. Like any other species, the presence of megafauna benefits some species while challenging others. Introduced megafauna can put huge pressure on plant communities, but this is also true of native megafauna. Whether we consider the ecological roles of introduced species like burros and brumbies as desirable or not depends primarily on our own values. But one thing is certain: no species operates in isolation. Although megafauna are very large, predators can have significant influence on them. In Australia, dingo packs act cooperatively to hunt wild donkeys, wild horses, wild water buffalo and wild boar. In North America, mountain lions have been shown to limit populations of wild horses in some areas of Nevada. Visions of protected dingoes hunting introduced donkeys and Sambar deer in Australia, or protected wolves hunting introduced Oryx and horses in the American West, can give us a new perspective on conserving both native and introduced species. Nature doesn’t stand still. Dispensing with visions of historic wilderness, and the associated brutal measures usually applied to enforce those ideals, and focusing on the wilderness that exists is both pragmatic and optimistic. After all, in this age of mass extinction, are not all species worth conserving? This research will be presented at the 2017 International Compassionate Conservation Conference in Sydney.